The Animal Science Department at UNL has a rich and diverse history. Explore some of the changes to the department and its facility throughout the years! The Meat Laboratory was completed in 1953 and dedicated to the memory of Professor William J. Loeffel, longtime meat researcher and former Department Chairman of the Animal Science Department, University of Nebraska. The Loeffel Meat Laboratory, a Federally Inspected facility, was designed for both undergraduate and graduate teaching, research and extension meat programs. The building contains a killing floor and a receiving room; cleaning room and a balcony for visitors; a cutting room with adjacent coolers and freezers; a research laboratory equipped for chemical, histological, and bacteriological work; a modern kitchen; lecture room; smokehouse and other meat processing rooms. Completed in 1969, Marvel Baker Hall permitted total integration of the staff members concerned with meat production and those specializing in dairy production. The facility has research and teaching capabilities that enhance the effectiveness of the Animal Science Department's public service. 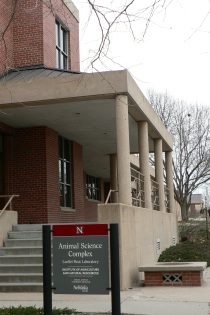 The academic community of animal agriculture centering in Marvel Baker Hall stimulates self improvement and development of the scientist-teacher on the staff. Nebraska's youth who study Animal Science profit through the excellence of the educational opportunities available to them including work in the analytical laboratories, the meat laboratory, and in the animal units as well as participating in extracurricular judging teams or other clubs. Richard "R.B." 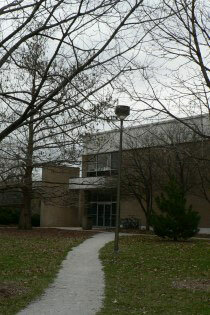 Warren was a member of the Animal Science Department, UNL, from 1956 to 1990. A Kansas native, R.B. graduated with a B.S. degree in Agriculture from Kansas State University and married Doris Kite in 1948. He completed an M.S. degree in Animal Breeding from Oklahoma State University in 1950 and served on the Animal Science faculty at Michigan State University for six years before coming to Nebraska. R.B. Warren enthusiastically developed young leaders for the animal industry through motivation, quality learning, skill development and personal mentoring. His legacy included one of the finest youth horse extension programs in the U.S. and development of the R.B. Warren Scholarship, the Nebraska 4-H Horse Fund, and other endowments to support horse programs, livestock judging, and student scholarships. His leadership and dedication have been rightfully memorialized in naming the UNL Animal Science arena the"R.B. 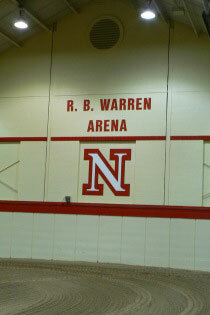 Warren Arena," dedicated in September 2006.